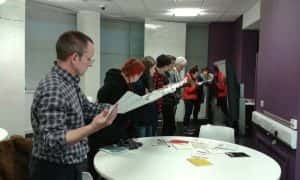 Our photography students got their hands on a rare and very precious piece of art history recently, thanks to the University Library Special Collections, and the work of Suzie Kitchin (Academic Liaison Librarian) and Carol McKay (Team Leader, Arts). Renowned Los Angeles-based artist Ed Ruscha published a series of books in the early 1960s that are widely recognised as seminal in the history of the artist book genre. Produced in limited print runs, they have become highly prized art works in their own right, held in the collections of major international galleries and museums, including London’s Tate Modern and New York’s Museum of Modern Art. Suzie Kitchin, Academic Liaison Librarian for Arts, Design and Performing Arts, and Carol McKay, Team Leader for Arts and Senior Lecturer in Photography, have written about how they recently revealed treasures by Ruscha within the University Library collections to second year students on the BA Photography, Video and Digital Imaging course.